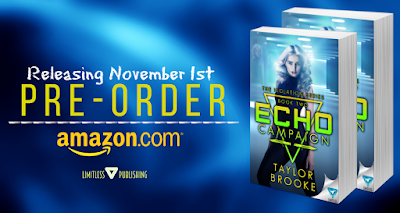 YA Bound Book Tours: Book Blitz Sign Up: ECHO Campaign (Isolation #2) by Taylor Brooke! Book Blitz Sign Up: ECHO Campaign (Isolation #2) by Taylor Brooke! Omen Operation (Isolation #1) is FREE from October 25-30 on Amazon! Get yourself a copy! Music fluttered through the speakers of a room unlike any other Brooklyn had seen at the facility. Tapestries hung from the ceiling, stitched with patterns of the solar system. Grand images of suns and moons and stars were placed upon the walls in the form of quilts, rugs, and blankets. Above them was a line of thin candles cradled in iron sconces. Light from their flames cast long shadows across the ceiling and darkened the bright threading of the obscure cloths. She didn’t recognize the song, but the gentle cries from a cello filled the room with a sense of calm that Brooklyn wasn’t comfortable with. The Limbic Simulation was a fear exercise, a way for Juneau to gauge their control over primal instincts. Whether flight would overcome the urge to fight or vice versa. Sweet chocolate and brown sugar filled her nostrils, the smell of baking cookies. Brooklyn inhaled as much of it as she could. As long as she kept her wits about her she could enjoy the small moment of peace presented to her. The candlelight, the pleasant smell, even the interesting tapestries made Brooklyn want to curl up on the floor and stay in that room. Maybe she would. Maybe she would ignore whatever monsters Juneau and his team had cooked up, and stay in this moment until it was taken from her by force, like everything else. A solid wooden door, carved with intricate swirling patterns and a gold doorknob was across from her. She listened carefully, and beyond the popping of the candles wicks, she heard a faint tapping, like fingernails against the other side of the door. She glanced over her shoulder to the docking station, wondering briefly if it would be worth it to turn around and not cooperate. To walk out of the room and back into the white hallway where Michelle and Gabriel probably waited for her. The tapping turned into scratching, like cat claws in the center of the wooden door. Brooklyn rolled her shoulders and stretched out all her fingers, cracking them against the side of her legs. Whatever was behind that door, it was going to die. That was what she told herself as she took long strides past the pretty hanging quilts, swallowed a last gulp of cookie scented air, and swung the door open. On the ground was Amber—a clone of her. It writhed with a hand wrapped around the deep wound on its throat. Blood soaked its shirt and its bulged eyes pleaded with Brooklyn for help. Its other hand, slick with syrupy blood, scrambled over Brooklyn’s boot. The clone’s voice faded and the life in its eyes dimmed. Brooklyn listened to its heart simmer out one beat at a time. Its crimson blood was the brightest thing in the room, harsh against the eggshell walls, and dark as it soaked the light mauve carpet. She stepped away from the body, well aware of the pair of eyes glued to her from across the room. Brooklyn kept her body poised for an attack. Cloaked by a slanted shadow in the corner of the near empty room stood another clone, one she’d prepared herself to see. Porter’s clone watched her, hunter and hunted,, but Brooklyn stood her ground. She met his gaze, rationalizing the jarring bit of panic that flew through her. The sight of one of their clones would always cause her nerves to jump, wouldn’t it? This was no different. Her initial thought was to flee, which surprised her, and the following urge was to wait. She saw his bare feet tap against the carpet. Her nostrils flared for a hint of emotion. Nothing. No fear, sadness, excitement, nothing but stagnant air. Brooklyn bristled but stayed quiet. Unwarranted heat rushed into Brooklyn’s cheeks. She straightened her back and curled her fingers into fists. A pain suddenly spiked in her lower abdomen, searing, achy knots. This clone was unlike any she’d encountered, and the thought made her violently uneasy. It slithered from the shadows, and like Porter, it had pools of whiskey for eyes. His intense gaze pushed into her like a dagger. Her voice crawled away, hidden in the back of her throat. He moved slowly like an ancient predator, a scaled, winding dragon taking inventory of its meal. Brooklyn wanted to back up but her legs wouldn’t budge. She tried to reign in her runaway heartbeat, to squash the irrational fear that was hollowing out her courage. The clone took another step, its nostrils flaring as it leaned toward her face and inhaled. Its lips tightened, and when it let the breath go Brooklyn could see the delicate curve of its cupids bow quiver. The fear buried inside her launched into her throat and Brooklyn lashed out, shoving the clone backward. She raised her fist, aiming it directly at its jaw. Its long fingers gripped her hand, catching the punch before she could land it. Her wrist crumbled. Her eyes watered. She felt all the strength in her body push toward the surface, but it was no use. The clone, stronger than anything she’d encountered before, slammed her smaller frame against the wall. It held her arms above her head, fingers latched around her wrists, its other hand snatching her jaw like a bear trap. “What are you?” Brooklyn whimpered, kicking her feet against its shins. Her strength was nothing against Porter’s clone. Her fear evolved into dismay, and then into hysteria. She thrashed. Her breath was hard to catch as the heated press of the clone’s body held her to the wall like she weighed nothing. The hand wrapped around her jaw moved down to grip her waist, and the clone laughed, eyes leaving burns on her wherever they settled. It closed the space between them, taking her lips in a searing kiss. She recoiled and slammed her teeth into its lip until she tasted blood. Next Brooklyn was falling, her body a heap, shaking on the floor. Taylor Brooke is the author of the upcoming sci-fi adventure trilogy The Isolation Series. She started out as a freelance makeup artist, and quickly discovered her love of elves, zombies, mermaids, kaiju, and monsters of all kinds. 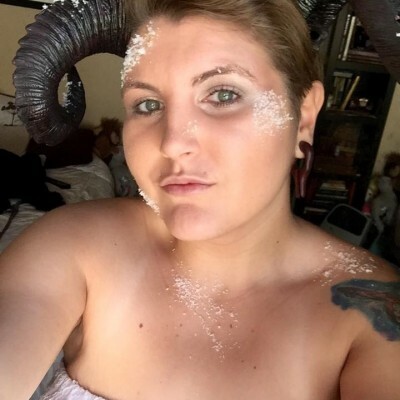 After receiving eight professional certifications in special effects makeup, working on countless projects, and fleshing out a multitude of fantastical creatures, she turned her imagination back to her one true love- books. Taylor has had a knack for writing since she was a little girl, and received recognition for her skills throughout grade school and junior college. When she’s not nestled in a blanket typing away on her laptop, she can be found haunting the local bookstore with a cup of steaming hot tea in her hands, scanning the shelves for new reads, or hiking one of the many mountains that surround her home in Oregon.